You have just watched your dream bull crest over the horizon. The majestic bull stands atop the mountain looking over his territory below; he is “royal” and knows that he is king. This was not a dream that I would need to awaken from. Don’t blink…my dream bull was waiting for me as this was my reality in the mountains of Montana. It was the second week of September and the bulls were beginning to display their dominance by taking out their aggression on the local trees and shrubs; violently raking their antlers in a fit of frustration, waiting for the upcoming rut to kick off into full swing. Bugles were pleading and desperate in sound. Many of the bulls were not yet with cows, just in the beginnings of their search for a hot cow. The desperation of the season was beginning to mount and the bulls were anxious to come in to the sounds of cows chattering on the mountain. The mood is infectious and your heart begins to live in your throat amongst all the excitement. 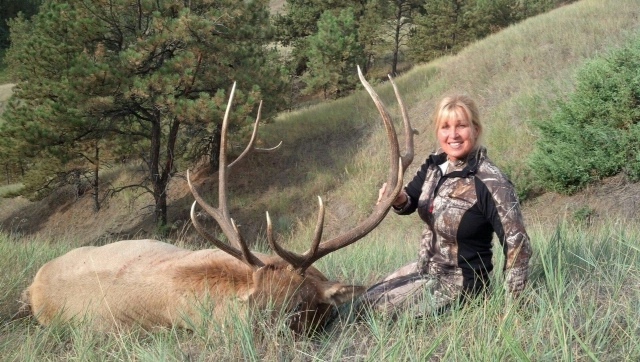 This was an uncommon elk camp with me and Vicki Reed, a successful competitive archer and avid hunter. Two girls in camp in pursuit of dream bull elk. Stay tuned for RMEF’s Team Elk Season 4 on the Outdoor Channel to see what went down in the mountains of Montana.